Too many finance departments still trudge through time-consuming period-end closing activities each quarter and year-end. journal entry management, and other critical period-end processes. Download The Blackline Datasheet For Close Management Solutions Now! Demands on the finance department are high. In the modern economy, CFOs need to find ways to reduce the time-to-report on many critical functions. Finding efficiencies in the Period-Close process can unlock a huge trove of revenue and human capital, allowing Financial Leadership to concentrate on other areas of the business. Over three decades, Business Solution Partners have earned a reputation as the Close Management specialists. Our team of CPAs, Business Process Consultants, and Solution Providers work together to provide your team with the strategies, technology and training necessary to achieve an automated close process you can trust. The experts at BSP are focused on bringing clients into the future with cloud-based software and modern processes. Business Solution Partners trusts BlackLine for our clients' Close Management needs. We're a Gold Certified partner focused on the integration of Blackline with your Enterprise Resource Planning (ERP) and Corporate Performance Management (CPM) platforms. Fully equipped to enable your company to transform the close process, BSP will guide you through the on-boarding process, integrate with your current systems, and train your employees to master the software. 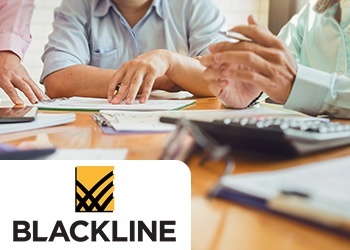 Eliminate error prone processes and time consuming manual reconciliations with Close Automation solutions from Blackline and Business Solution Partners.